"An elderly lady residing in Turkey served this to a friend of ours while he was in that country several years ago. She has since passed away, but her recipe lives on. 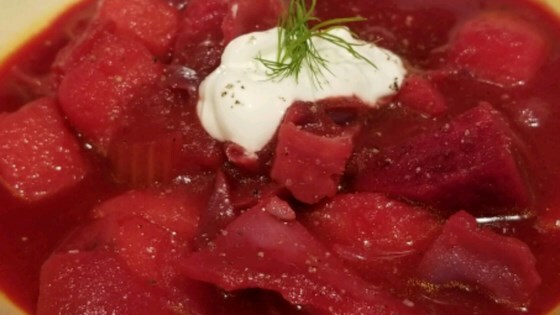 It is the best Borscht recipe I've ever enjoyed. Serve topped with sour cream, extra dill weed, chopped fresh tomatoes." Place sliced potatoes and beets in a medium saucepan over high heat; cover with stock, and boil until vegetables are tender. Remove potatoes and beets with a slotted spoon, and reserve stock. Melt butter in a large skillet over medium heat. Stir in onions, caraway seeds, and salt; cook until onions become soft and translucent. Then stir in celery, carrots, and cabbage. Mix in reserved stock; cook, covered, until all vegetables are tender, about 10 minutes. Add potatoes and beets to the skillet. Season with black pepper and dill weed. Stir in cider vinegar, honey, and tomato puree. Cover, reduce heat to medium low, and simmer at least 30 minutes. Serve topped with sour cream, extra dill weed, and chopped fresh tomatoes. See how to make a simple cabbage soup with ground beef and veggies. Don't even bother. This is NOT borscht. I lived in Ukraine and Russia, and married a native Ukrainian. If you're looking for authentic Russian borscht, keep looking and pass this one by. For those of you who have trouble with your beets still being hard, try grating the beets for the soup rather than dicing them, that's how my Baba did it.